This year, perhaps more than ever, swath timing is critical for all varieties of canola. With the cold soil temperatures and dry spring and summer, there are many canola fields in Alberta and across Western Canada that are in a variety of stages and maturing at different times. Multistaged canola can make it difficult to determine an appropriate swathing time, but Doug Moisey from the Canola Council had some tips at a recent Canola Harvest Management meeting, just south of Vermilion. Doug says the best approach to timing your swathing is to be very thorough in checking the field. This may mean checking every 2 or 3 days (when temperatures are hot as they have been, canola can change 10-20% in a day) and looking at multiple areas in the field. When you drive up, stand on the quad or in the box of the truck and try to get a feel for the field. Hills and knolls will mature more quickly than coulees and lower lying areas. From here, determine how many “maturity zones” you have. These are areas that are at different maturities – the hills may be at 20% seed colour change whereas the valleys may be just finished flowering. Try to pick plants from each area to look at. When picking a plant, select randomly and look at a few plants in each area. Canola matures from the bottom up, so plant colour and what you can see from the road are not good indicators. Remember when it is hot and sunny that canola can “tan” or “sunburn” resulting in that purple-red-brown you may see on the tops of pods. This does not necessarily indicate seed colour change. I have been called to a lot of fields this year that growers thought were ready, as they are seeing this colour change from the road when, in fact, all of the seed is still green. Doug also indicated growers across western Canada are seeing this same colour change due to excessive heat and sun. When determining seed colour change, find the main stem of the plant, and check the pods from the bottom up. Canola matures from the bottom up and the inside out, so while your main stem may be showing 50% colour change, your side branches may just be starting. If the skin rolls off the seeds between your fingers ( like an onion) then the seed is not mature. When I am scouting, I count any seed with a black or brown spot on it as changed. With the harvest being so late this year, I do worry that growers will be swathing early in hopes of beating a frost. With these high temperatures of late, we can afford to wait the extra days to optimal seed colour change rather than risk the green seeds of swathing early. 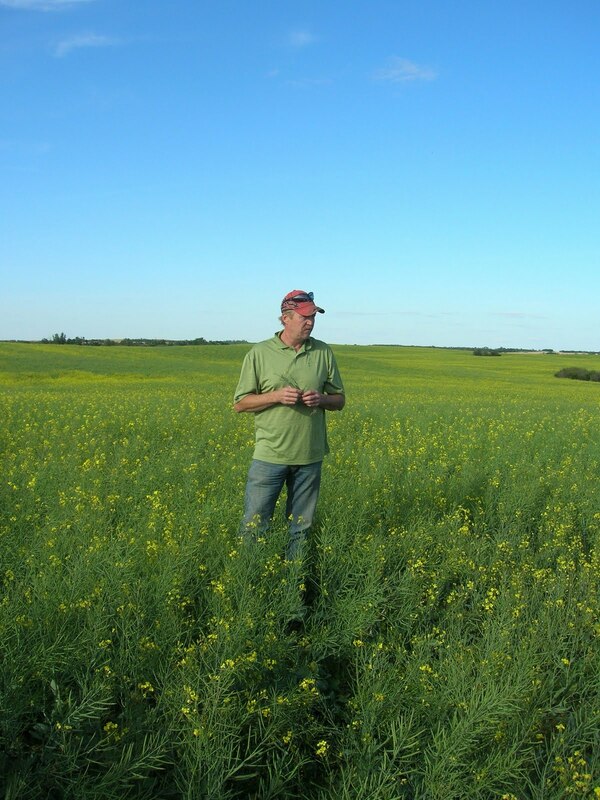 Doug states that maximium yeild can be acheived by swathing at 50-60% seed colour change. Waiting for this timing will pay off in the end, as shelling will be minimal when compared to a quality loss from a high green seed count. Overall, take the time to look at your canola, segregate the maturity zones and decide where your highest yeilds are going to come from in the field. Focus on these areas and determine swath timing based on the best parts of the field. Also, dont be scared to swath in zones. If part of the field is ready 3 days before another, then come back to the greener areas later. The Canola Council website offers great timing guides and articles on the subject of swathing if you are interested in further information. Good luck and happy harvest. You are currently browsing the archives for the harvest category.